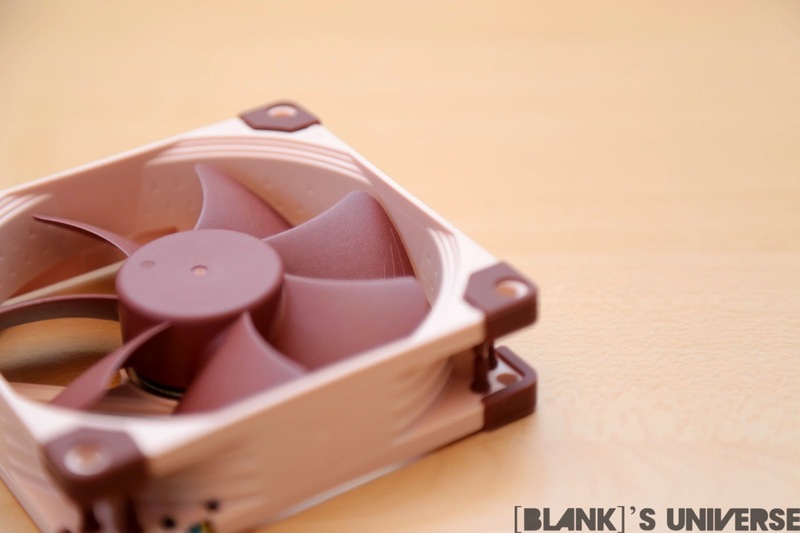 Noctua has expanded and updated their A line of fans with new, smaller sized versions than the widely used 120mm and 140mm variants. The smaller 40mm, 80mm, and 92mm fans have finally been updated to feature some of their new built in vibration dampening frame, as well as new bearings and micro-structures. 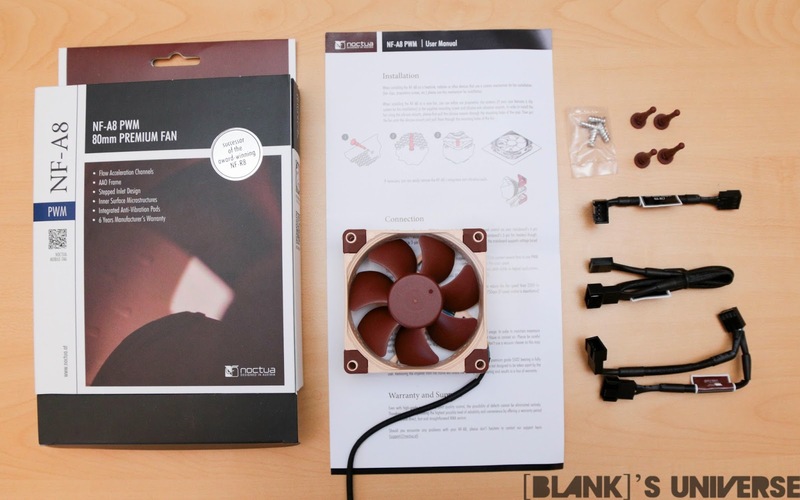 Noctua is know to have a high standard for their premium fans as well as a complete set or accessories for each one. The addition of the 40mm fan opens up options to replace the small noisy fan in your NAS or a rack mount server. The NF-A9 is available in FLX and PWM versions, the NF-A8 is available in FLX, ULN, and PWM versions, and the NF-A4x10 is available in a 5V version only. Each version of the fans come with it's own set of accessories which vary depending on version. All versions do include a 30cm extension cable, four fan screws, four Anti-vibration mounts, and a six-year warranty - which will most likely outlast the lifetime of the computer it is in. The inclusion of the OmniJoin adapter with the NF-A4x10 allows the use of the fan with proprietary connectors without additional soldering. 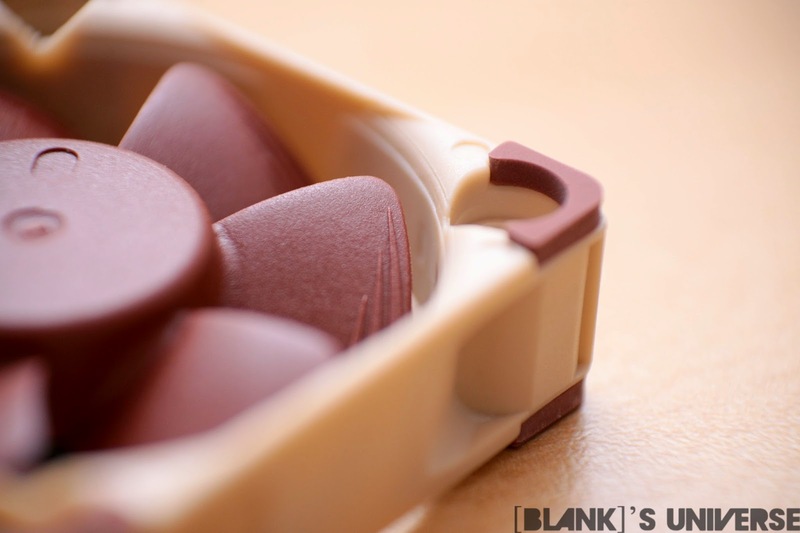 The fans come packed in the same brown and white packaging with a plastic clam shell package inside holding the fans and accessories. The front of the box opens up to show the contents and the back opens as well to show the technology that went into creating the fan. 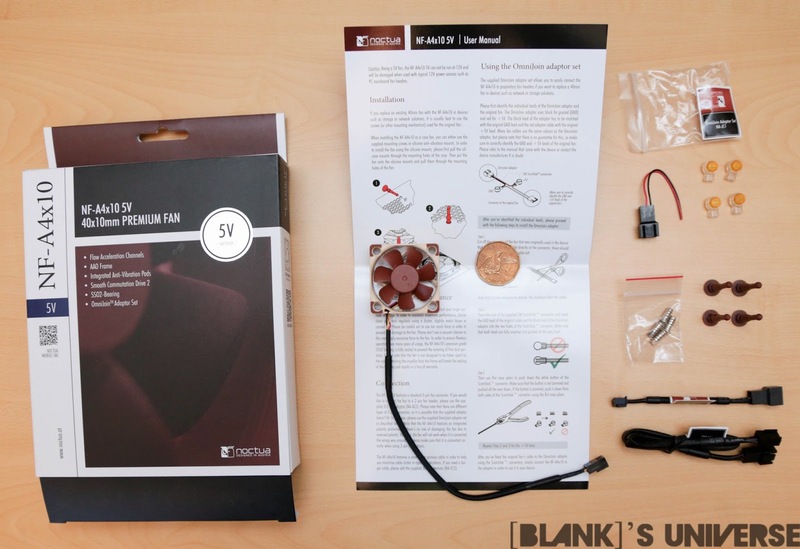 Noctua fans are the only fans I know of that include a user manual in the package. The NF-A9 is the successor to the NF-B9 and incorporates the new technology found in the newer generation of fans such their AAO frame, stepped inlet design, and inner Micro surfaces. These all work together to provide improved and silent operation compared to their previous designs. The fans now also come with the integrated anti-vibration pads not found on the NF-B9. The fans also has the new SSO2 bearings which help improve performance, silence, and durability. The FLX model runs at 1600 RPM without any adapters, 1250 RPM and 1050 RPM with the low noise and ultra low noise adapters respectively. The NF-A8 is the successor to the NF-R8, like the NF-A9, it incorporates the same new technology to improve upon itself. The AAO frame, stepped inlet design, and inner Micro surfaces all work together to provide improved and silent operation compared to their previous designs. The fans now also come with the integrated anti-vibration pads not found on the NF-R8. The fans also has the new SSO2 bearings which help improve performance, silence, and durability. The ULN model runs at a slower at 1400 RPM without any adapters and 1100 RPM with the low noise adapter. The PWM model runs at 2200 RPM at its peak and 400 RPM at its minimum. 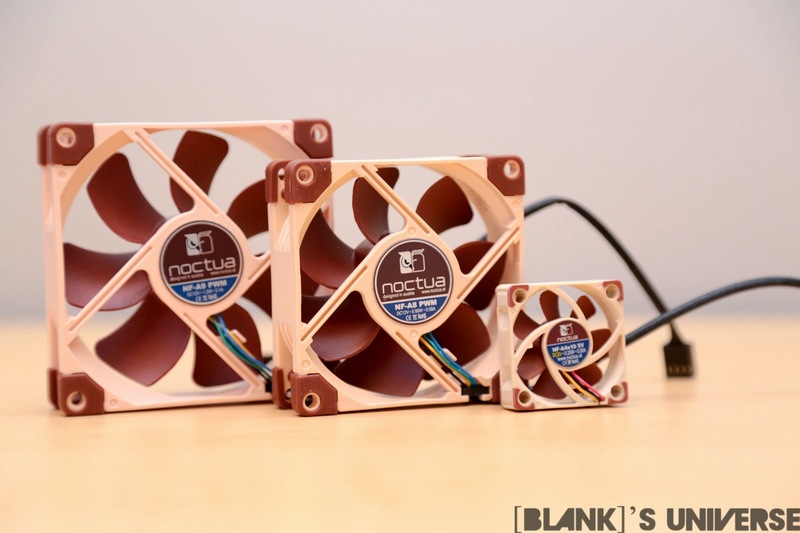 The NF-A4x10 is Noctua's first 40mm sized fan. It measures a mere 10mm thin and is the only fan to include the OmniJoin adapter. This adapter allows the use of a proprietary connector without needing to solder one on. There are 4 adapters included but only two are needed to attach a connector, nice to see Noctua include extras. The NF-A4x10 still includes all the the technology implemented in Noctua's larger fans and its cool to see them in such a tiny form. It is also the only Noctua fan to run off a 5V supply instead of the standard 12V. The fan noise was measured using a Db meter with a sound floor of 26Db at 10cm from the fan. 30Db is considered silence in a normal room so the results are the difference between the sound floor and the measured sound. 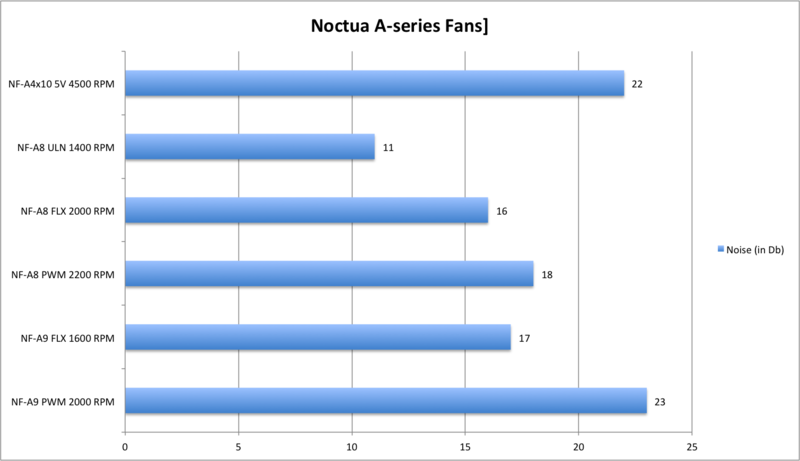 The NF-A9 PWM seems to be the loudest fan of the bunch while the others maintain silent operation. The 40mm fan does run quite loud but is to be expected considering its size. The NF-A4x10 is designed to run on 5V but uses the same 3-pin connector as 12V fans. This can easily be plugged into a standard motherboard supply of 12V and it would have been nice to see Noctua include an adapter to prevent this. The only time I would see a NF-A4x10 used in a standard computer would be on ASUS' TUF series motherboards. The new A-series fans bring all the improvements from the new 120mm and 140mm fans into the smaller sized fans of the A-series. Its nice to see Noctua continue to improve on less popular fan sizes as most computers use 120mm or 140mm fans now. 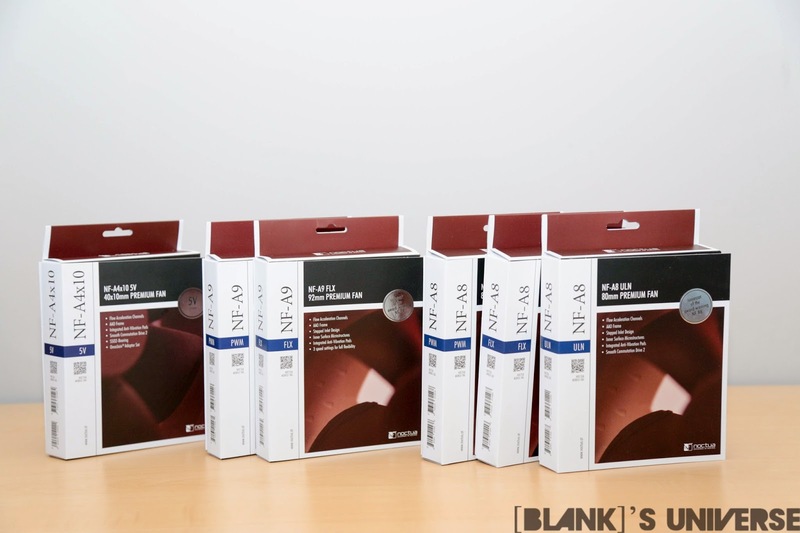 People with older computers will be glad that they have not been left out and can take advantage of the new Noctua fans in their older cases. The 40mm NF-A4x10 is also an interesting addition to their lineup. 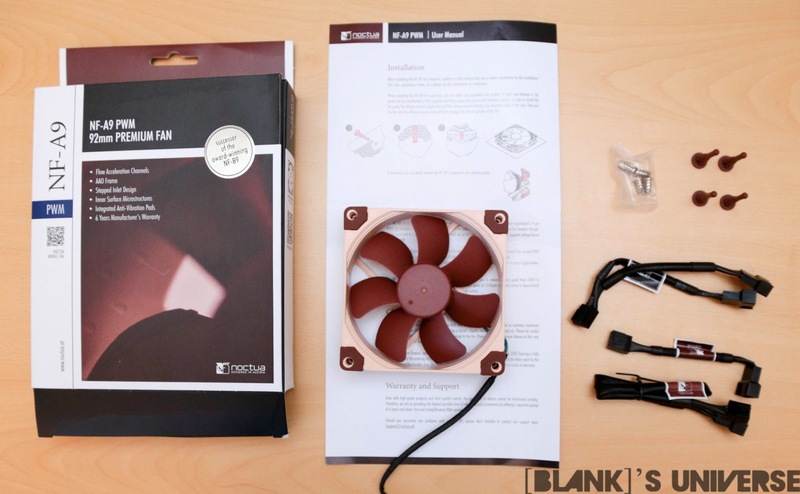 Noctua is the only consumer fan manufacture I know of that has a 40mm version of their fan and considering Corsair and BitFenix don't even have 80mm or 92m version, is very nice to see. 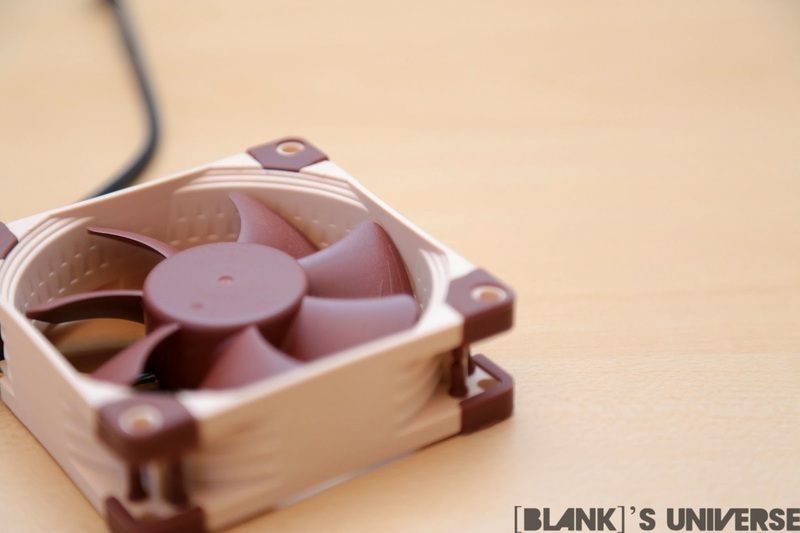 Smaller fans tend to run louder than larger versions so users with older computers or smaller HTPC cases may find the quiet Noctua fans a extremely pleasant upgrade.